Hi Blog Family! I am linking the jeans I wore today below for those that want to try a pair of Cato Denim! I am also linking two other favorites I purchased and loved because they fit perfectly! Happy Shopping! Fall is around the corner, and that means denim, denim, and more denim! And what better way to preview the Cato Fall denim collection than with a sponsored partnership! I've been a fan of Cato's since I was in college! I love their sizing, styles, and materials, especially their denim! And over the years, some stores added little girls and wider selection in junior sizes! What do you look for in denim? For me, I love denim with stretch material because I am petite and curvy and denim is always hard to find! But not at Cato's! They have denim sizes from 2 to 3x! They cater to all body types, all shapes, and all sizes! And some of their denim is also recycled material, which makes it even better! Hello Loves! 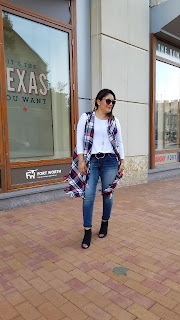 As we wind down Summer (which went by way too fast for this Mom) we get into Fall looks and styles which I am going to be loving this Season! I still have so many Summer pieces that I will transition into Fall because I got them on clearance and the deals were too good to pass! Today's look is styling my New York and Company Soho T-Shirt dress three different ways! This t-shirt dress can go from daytime to date night or even girl's night! The dress is available on the New York and Company website, scroll down and click shop Soho Street! The sizing is true to size! I am wearing a medium only because I am curvy and bottom heavier, so a small would've been a bit snug! Snug doesn't look good ladies! Okay, okay, I don't have to tell you guys over and over that I am the biggest Jennifer Lopez fan ever! But I just did, again! Her style is impeccable and effortless! And when I see her in something I know I would want to have, I recreate it! Why, because lets face it, this mom of four only dreams of wearing Versace, but my wallet says, ummm, no girl! Dress for Less! I decided to recreate this Jennifer Lopez look from her outing in New York on July 31, 2018 for many reasons! 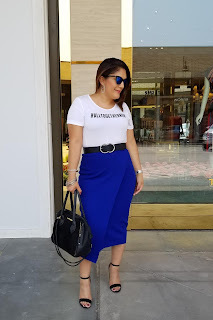 It chic, street style, and so me! Effortless and crisp! I love it! So, let me break down my outfit with prices and where I found them!